This wonderful, vivid painting shows the moment that Tanker 10, Number 911 releases nearly 12,000 gallons, or just under 2 Olympic swimming pools worth, of fire retardant. The spotter plane, a King Air, leads the loaded DC-10 to the fire and marks the release point with smoke. the following DC-10 releases the retardant at the beginning of the spotter plane smoke marker. At the bottom of the painting, a Sikorsky S-64 Sky Crane is finishing loading with water and is getting ready to go back into the fray. 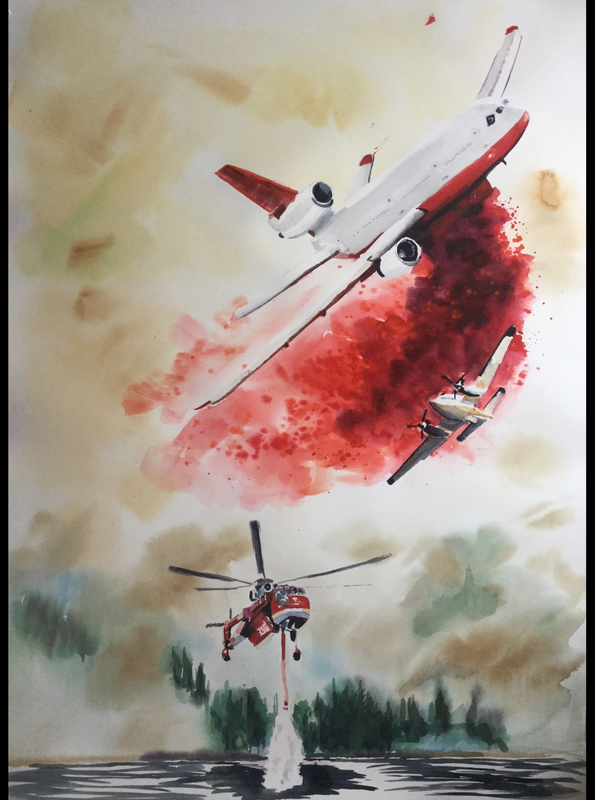 Aerial firefighting involves the use of aircraft–both fixed-wing and rotary-wing–to combat wildfires. Among the fixed-wing type are air tankers and water bombers equipped with tanks that can be filled with fire retardant or water. Tanker 10 is a converted McDonnell Douglas DC-10 commercial airliner. It’s a three-engine, wide-body aircraft that was first introduced in 1971 and was in service with American Airlines, Hawaiian Airlines, and Pan Am. Production of the DC-10 ended in 1989. In 2002, the company 10 Tanker Air Carrier began proof-of-concept testing of the DC-10 VLAT in an aerial firefighting role. In 2006, the aircraft was issued a Supplemental Type airworthiness certificate by the FAA which allowed it to be modified for aerial firefighting. Shortly thereafter, the DC-10 VLAT was certified as an air tanker by the United States Forest Service and was first used in California during the 2006 wildfire season on a “call-when-needed” basis at the price of $26,500 per flight hour. One retardant drop from the DC-10 covers a swath roughly 300 feet wide and one mile in length, four times the coverage of any other tanker currently in use. Tanker 10 is also capable of multiple drops from a single load.